The sporting world learned of Minnesota Timberwolves’ coach, president, owner and adopted son Flip Saunders’ cancer in August and Sunday we were saddled with the terrible news of his passing. 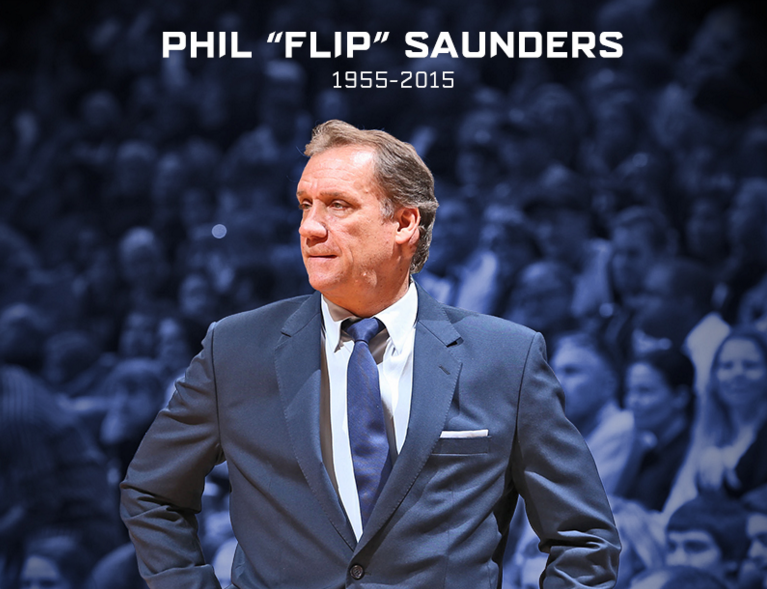 Former Gopher Philip “Flip” Saunders, 60, had been described as an ambassador for basketball and a “basketball lifer.” Fans and players reminisced about Flip’s impact after news broke of his passing due to Hodgkin’s Lymphoma. Saunders played point guard and coach-on-the-floor for the Golden Gophers from 1974-1977 as an important player in a strong era of Gopher basketball. From college, he began a career in coaching college and professional basketball, starting in junior college, moving on to the Continental Basketball Association and eventually the NBA where he reunited with former Gopher teammate Kevin McHale. The native Ohioan Saunders was the only successful coach the Timberwolves have ever had, leading the team to its eight playoff appearances and the tenure of the greatest Wolves’ player. Saunders is one of 10 coaches to lead teams to both the Eastern and Western Conference Finals. He had started his second stint with the Wolves in May 2013 as President of Basketball Operations. “The loyalty and the passion that the people have here is what always drives me back,” Flip said about Minnesota. Among those that posted or shared their thoughts on Flip were former teammates and players such as Ricky Rubio, Chauncey Billups, Amir Johnson, John Wall, Mychal Thompson and more. Current Bulls’ head coach Fred Hoiberg played for the Timberwolves for two seasons under Flip. “He was a great leader. a special special person,” said Hoiberg. Vikings’ head coach Mike Zimmer said he was lucky to meet Flip, “a really good man.” Gopher basketball head coach Richard Pitino said Flip never had to be as nice and welcoming to him as he had been. “Humble, very caring about everybody, a nice guy and a leader,” said Gopher great Thompson. Chauncey Billups played for Saunders in both Minnesota and Detroit and considered Flip a friend for life. “[Minnesota] was where my career kind of turned around and it all had to do with Flip Saunders,” said Billups. The NBA and Timberwolves issued statements, but one of the best was this simple image from Kevin Garnett. All you will see people say of Saunders is that he was truly a good man and that the kind words were not merely a product of his passing. His influence will be missed and our hearts go out to his family including his wife Debbie and four kids. “He was the kind of coach I’d want my sons to play for,” said Thompson. The Wolves open the regular season Oct. 28 against the Lakers with Sam Mitchell on the bench.